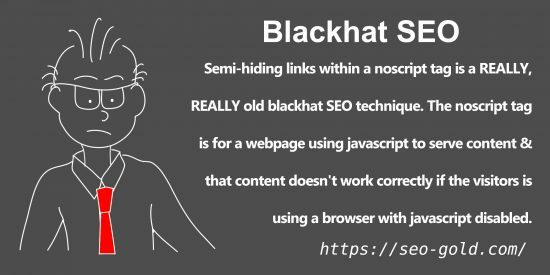 Stumbled on an interesting blackhat SEO link building strategy this week that those tending towards the whitehat SEO arena should steer well clear of. I’ve been testing free SSL certificates from Letsencrypt and had signed up to their forum for support. 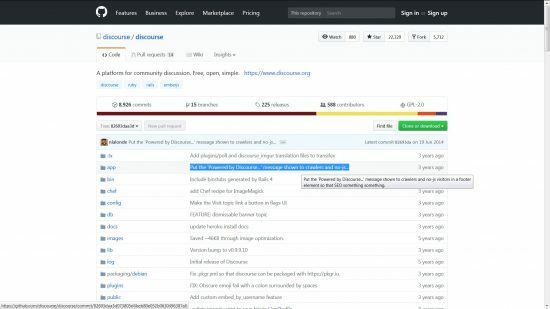 Letsencrypt uses the Discourse Forum Software from discourse.org. After 15+ years of SEO research I find it difficult to visit a website without having a look at the HTML code behind the curtain and as I visited the Discourse Forum I viewed source (Right Click the webpage, “View Page Source”) and found what appeared to be a semi-hidden link within a noscript tag. That got my SEO juices flowing: that sounded much better in my head!!! For the record the people behind the Letsencrypt site (and other Discourse Forum script users) haven’t done anything blackhat, they like many other unsuspecting webmasters have installed the Discourse Forum script to run their forum: it’s the people behind discourse.org who are using blackhat SEO link building techniques to build quick backlinks to their sites. What’s a Semi-Hidden Link Within a Noscript Tag? Normally I’d confirm the hidden text link by viewing the Googlecache of a webpage, but I got lazy and assumed it would be in the cache and informed the Letsencrypt forum they have a hidden link and should fix it ASAP: Hidden Link to Discource.org, Potential SEO Issue (I was in that much of a rush I also spelled Discourse wrong, Doh!). Eventually I checked the Googlecache and here’s where it got interesting, we now go into the hidden realms of blackhat SEO cloaking techniques. 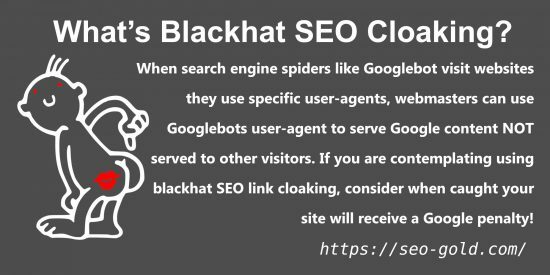 What is Blackhat SEO Link Cloaking? When search engine spiders like Googlebot visit websites they use specific user-agents, webmasters can use Googlebots user-agent to serve Google content NOT served to other visitors. If you are contemplating using blackhat SEO link cloaking, consider when caught your site will receive a Google penalty! For example you might have links in an image-map, image-map links can not be indexed by Google, so it would be acceptable to serve Googlebot those links in another format. General visitors see the links in an image-map, Googlebot sees them as text links or standard image links (a clickable image link). As long as a general visitor and Google sees pretty much the same content AND you aren’t gaming Google, it’s acceptable to use cloaking. This is where what discourse.org are doing gets interesting. What Discourse are doing here is checking for the Googlebot user-agent and serving different content to Googlebot. Potentially a Google penalty incurring SEO issue. It’s quite clever blackhat SEO setup that’s not easy to spot. Googlebot gets a sitewide text link to the Discourse home page, as it’s not within a noscript tag** Googlebot will definitely pass full SEO benefit through this link. ** Some SEO experts argue links within noscript tags won’t pass full SEO link benefit because they are hidden to most users: from an SEO perspective it’s difficult to test, so best to avoid adding important links within noscript tags if they aren’t available in standard body text. That’s 1.7 million webpages using that exact phrase, that’s probably 1.7 million hidden backlinks, some serious link benefit they are stealing from their forum software users! 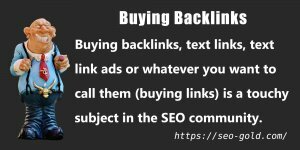 There’s an SEO market for buying/selling links, it could cost hundreds of thousands of dollars to buy this number of text links from quality websites and they are getting them for free. If a webmaster notices the above links in the Googlecache say and check out their forum (viewing source) they find the link within the noscript tag, which though not a particularly ethical way to gain a link it does at first viewing match the Googlecache so doesn’t look like cloaking. In my opinion this is a deliberate blackhat SEO attempt to hide the backlinks from forum owners. In comparison phpBB forum software has a similar powered by link, but it’s visible to everyone (forum visitors and Google) and there’s loads of articles online about how to remove the phpBB forum links. By hiding the Discourse.org links this way only the most SEO knowledgeable webmasters are going to notice these text links and look to remove them. Put the ‘Powered by Discourse…’ message shown to crawlers and no-js visitors in a footer element so that SEO something something. It would appear the links are added for SEO reasons, what are the SEO reasons? Deleted Discourse Forum Post About Blackhat SEO Link Cloaking! Fortunately I always keep a copy of everything I post to forums etc… (not my first rodeo :-)) and have posted the deleted forum post as a comment below and took screenshots of the forum posts GoogleCache. Update: Made an error below, the Discourse software has a feature where links posted by trusted forum members are NOT nofollow. My mistake was seeing links to discourse.org lacking nofollow which were posted by a trusted forum member (pure coincidence) and jumping to the wrong conclusion it was another blackhat SEO link building technique. I was wrong, everything within the “More Blackhat SEO Techniques Used by Discourse Forum Software” section below is wrong. 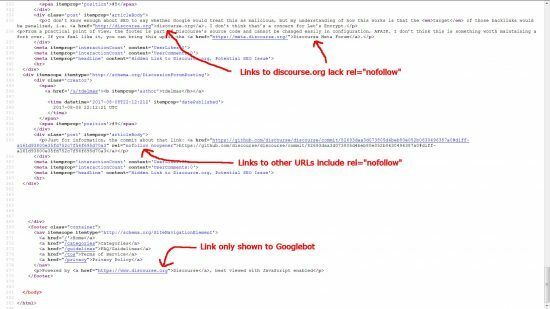 Thanks to PFG (via a comment) for clarifying why some links lacked rel=”nofollow” tags. 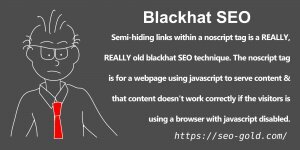 I’ve kept the section because even though I was wrong it’s a possible blackhat SEO technique to look out for: if I were into blackhat SEO techniques I could use it with the WordPress SEO themes and SEO plugins I release. 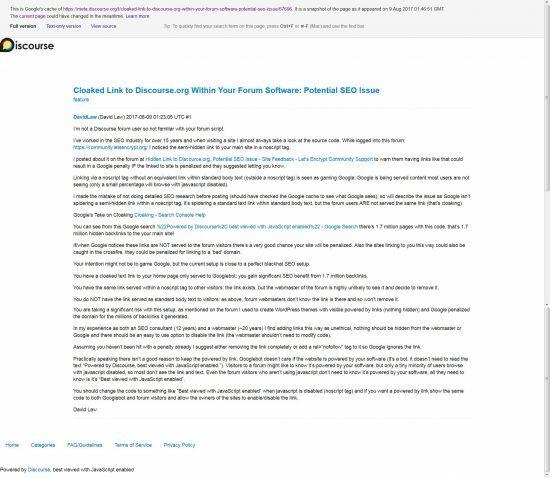 It gets better, as I was writing this blackhat SEO tutorial I noticed when viewing source of the Googlecache of Discourse forum posts links to discourse.org are NOT rel=”nofollow”! 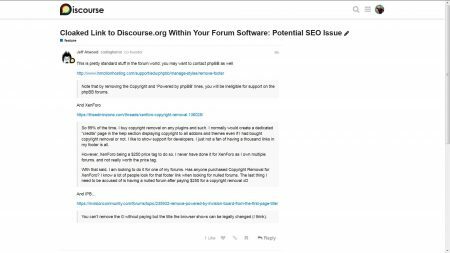 Like most forum software scripts, Discourse adds a rel=”nofollow” tag to links added by forum users, this is to stop forum spammers from benefiting SEO wise from the links: Google ignores links with the nofollow tag and passes no SEO benefit. It would appear Discourse have added an exception for links to their own sites!!! WOW, now technically not blackhat SEO per se, but you have to admit it’s very shady and not particularly ethical especially when taking into account the 1.7 million indexed cloaked backlinks. Note to the Discourse forum software developers etc… feel free to make a comment to explain the link to your home page that’s served from 1.7 million webpages. I won’t delete your comments as long as they aren’t abusive. I’m not a Discourse forum user so not familiar with your forum script. I’ve worked in the SEO industry for over 15 years and when visiting a site I almost always take a look at the source code. While logged into this forum: https://community.letsencrypt.org/ I noticed the semi-hidden link to your main site in a noscript tag. I posted about it on the forum at https://community.letsencrypt.org/t/hidden-link-to-discource-org-potential-seo-issue/39763 to warn them having links like that could result in a Google penalty IF the linked to site is penalized and they suggested letting you know. 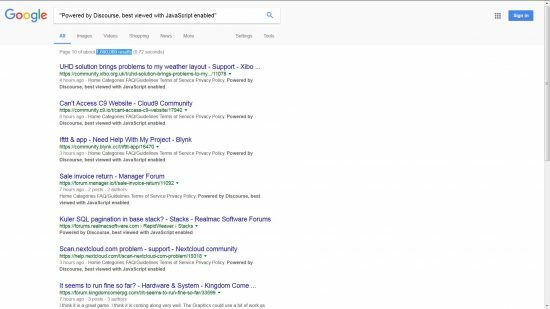 Linking via a noscript tag without an equivalent link within standard body text (outside a noscript tag) is seen as gaming Google: Google is being served content most users are not seeing (only a small percentage will browse with jasvascript disabled). I made the mistake of not doing detailed SEO research before posting (should have checked the Google cache to see what Google sees), so will describe the issue as Google isn’t spidering a semi-hidden link within a noscript tag, it’s spidering a standard text link within standard body text, but the forum users ARE not served the same link (that’s cloaking). If/when Google notices these links are NOT served to the forum visitors there’s a very good chance your site will be penalized. Also the sites linking to you this way could also be caught in the crossfire, they could be penalized for linking to a ‘bad’ domain. Your intention might not be to game Google, but the current setup is close to a perfect blackhat SEO setup. You have a cloaked text link to your home page only served to Googlebot: you gain significant SEO benefit from 1.7 million backlinks. You have the same link served within a noscript tag to other visitors: the link exists, but the webmaster of the forum is highly unlikely to see it and decide to remove it. You do NOT have the link served as standard body text to visitors: as above, forum webmasters don’t know the link is there and so won’t remove it. 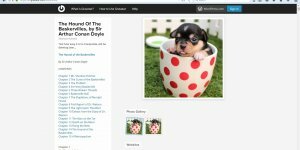 You are taking a significant risk with this setup, as mentioned on the forum I used to create WordPress themes with visible powered by links (nothing hidden) and Google penalized the domain for the millions of backlinks it generated. In my experience as both an SEO consultant (12 years) and a webmaster (~20 years) I find adding links this way as unethical, nothing should be hidden from the webmaster or Google and there should be an easy to use option to disable the link (the webmaster shouldn’t need to modify code). Assuming you haven’t been hit with a penalty already I suggest either removing the link completely or add a rel=”nofollow” tag to it so Google ignores the link. Note that by removing the Copyright and ‘Powered by phpBB’ lines, you will be ineligible for support on the phpBB forums. So 99% of the time, I buy copyright removal on any plugins and such. 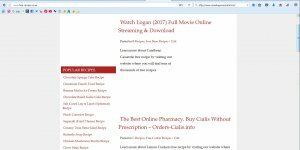 I normally would create a dedicated “credits” page in the help section displaying copyright to all addons and themes even if I had bought copyright removal or not. I like to show support for developers. I just not a fan of having a thousand links in my footer is all. However, XenForo being a $250 price tag to do so, I never have done it for XenForo as I own multiple forums. and not really worth the price tag. You can’t remove the © without paying but the title the browser shows can be legally changed (I think). The “Powered by phpBB” link isn’t hidden from forum visitors, I’ve built forums using their forum script and all visitors see the same code. When I visit a Discourse forum I do NOT see the text link to the Discourse site because you are serving Googlebot an alternative version of the site (that’s cloaking). This looks like blackhat SEO to me and I’ve tested blackhat SEO techniques to see how far you can push Google. I would not do what you are doing on an important domain, the risk is way too high. It’s OK to serve Googlebot a modified version of a site, but Google must see the same content as a standard visitor and right now that’s not the case. If you think that link is so important, do what others do and serve the same code to everyone. It’s also a risk adding visible links like the “Powered by phpBB” links, Google sometimes downgrades links like those as well. All it takes is one person to report your site (competitors love this sort of stuff) and you might get manually reviewed. Are you confident you can justify the reason for the hidden link resulting in 1.7 million backlinks to a Google manual reviewer??? Try now, why is it hidden to normal visitors? If you can’t make a valid case for the hidden link, remove it. If I were a Google manually reviewer I’d slap your domain with a huge link penalty for gaming Google. I assume you use Google Webmaster tools, you’ll get a notice if you ever get a penalty. I’ve seen domains banned for far less than this, you are risking your business with this blackhat SEO technique. This does make for a good SEO lesson, I’ll be writing this up as a blackhat SEO tutorial for my SEO site. Few hours later the entire forum thread was gone and my Discourse account was deleted. I guess they don’t like being called out for abusing the trust of their forum script users! 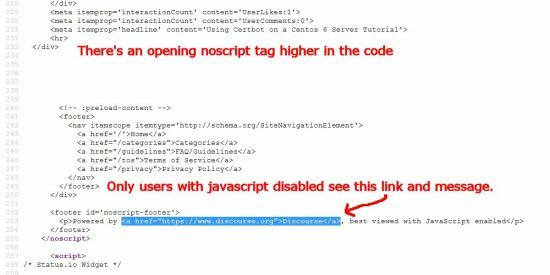 If you use the Discourse Forum script you are sending a sitewide hidden link to the Discourse home page. This is taking advantage of your trust and damaging your sites SEO (these links cost YOU link benefit). I suggest going to their forum and insist they justify the above blackhat link building SEO technique which is both threatening the long-term success of the Discourse.org site and YOUR forum: if they are hit with a Google blackhat SEO link penalty, you are linking sitewide to a bad domain. FWIW, the nofollow behaviour in links contained in posts depends on the trust level of the poster. The post without nofollow was made by a user with trust level >= 3, other links posted by users with different trust levels (like the one to discourse.org in the first post of that thread) use nofollow. I believe this was implemented to make comment spam less useful.